In collaboration with the UW Engineering teams, we created a cohesive aesthetic language with mood boards and concept sketches. We interviewed users of various public transit options to find pain points we could improve on. Our goal was to make Hyperloop's rapid transit as comfortable and efficient as possible, utilizing near-future technology to empower users and promote community. This sketch resounded the most with both our design team and the rest of the UWashington team. A central walkway encourages free movement, while recessed seating areas allow for a more intimate experience. Rotating chairs keep groups together and encourages a communal environment without forcing interaction. 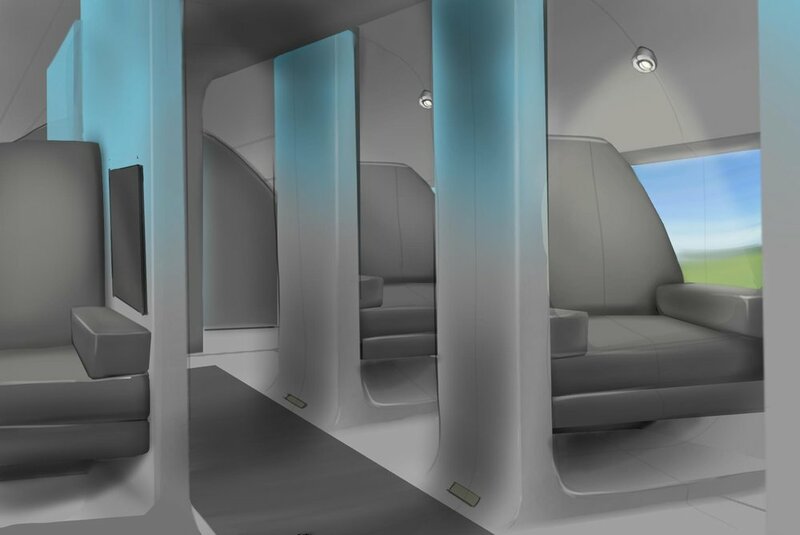 Hyperloop pods travel through solid, enclosed tubes — keeping passengers from viewing the outside world as they zip by and potentially causing claustrophobia. We wanted to solve this problem by implementing VR window displays to simulate windows into the outside world. We also saw this as an opportunity to provide meaningful information and interactions as overlays over the displays. General travel information could be shown for each passenger, allowing for peace of mind and efficient travel planning. We kept our VR overlays simplified and straightforward, sectioning off different types of information into scrollable pages: basic trip information, weather patterns, and expected arrival times. We learned from our interviews that most people focus on no more than a couple unique and specific tasks while riding public transit (eg. checking emails, listening to podcasts, browsing Facebook, etc.) We wanted to incorporate this user flow into our interior experience by supplementing the universal VR displays with additional personal interfaces built for user-specific tasks. Using mixed reality technology, this initial concept of mine projects icons and screens onto a physical desk space, providing an immersive and personalized experience for each user. This interface is built to maximize multi-task efficiency for a 30 minute ride. Early context shot of both interfaces in action. The personal AR interface makes use of Z-axis and depth of field to differentiate active and passive states between windows. A large opaque background is projected on the back of the table to reduce visual noise and increase privacy. This design would be dependent on a physical table existing for each user. We texturized and colored the interior to blend together seamlessly, highlighting the simulated outside view without competing highlights. Smooth, rounded faces complement the pod's swoopy, streamlined design. We designed rotating chairs to accommodate for user-directed community. Giving riders control over when and how they engage with others allows for natural, organic interactions. This design allows you to look outside, converse with each other, or work privately - your choice. We made sure to keep enough room between seats so that people could face each other at any point without bumping into each other. 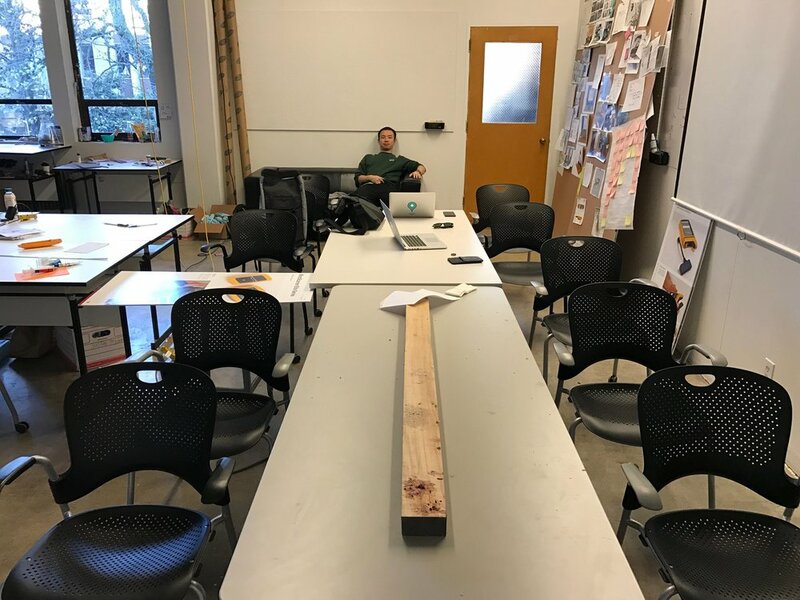 Our virtual desk station concept ended up being a bit too conceptually forward-thinking, and was difficult to blend into the sleek, simplistic aesthetic of the rest of our design. Our role on the UWashington team was to supplement their prototype without taking the spotlight from what was an engineering-led competition. 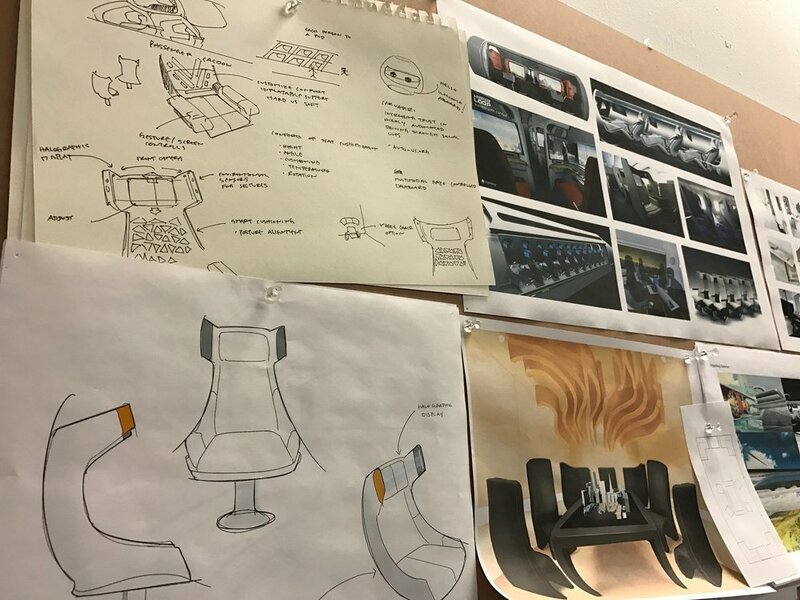 With this in mind, we reduced the footprint of the interface designs to blend in with and show off the rest of the pod design. This design incorporates a similar mixed reality blackout curved background, while incorporating a faded gradient carousel to easily flip between apps. This design encourages an immersive user flow, without preventing people from interacting with those around them. An opaque display to procure privacy and minimize ambient light, for those who want to nap or sit without any distraction. An overlay mode over softly blurred outside visuals to provide trip details, weather info, and travel planning options. A crystal clear simulation of the outside world for the rider who wants to watch the landscape fly by. We recently compiled our work into 3 posters for a presentation at UWashington Hyperloop's local press reveal on Jan 19th.